If your cart ever needs replacement parts, the other items in this section will fit the Utility Cart. SEE COMPLETE UTILITY CART FRAME ON ASSEMBLY PAGE. SHIPPING CHARGES WILL BE ADDED ON THIS PRODUCT. 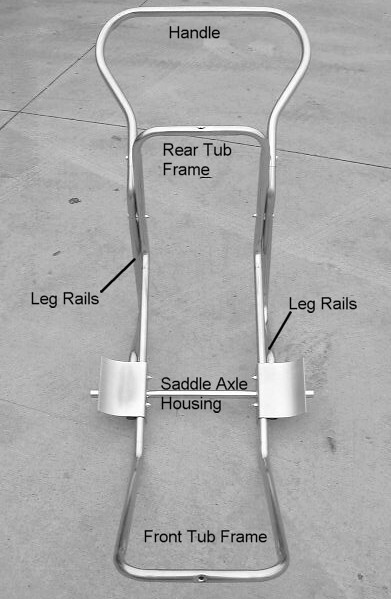 UTILITY CART AXLE - 3/4" x 32.5"
INCLUDES TUB CLAMPS, SKID PLATES, AXLE HARDWARE. SHIPPING CHARGES of $5.00 WILL BE ADDED ON THIS PRODUCT WHEN ORDERED SEPARATELY.